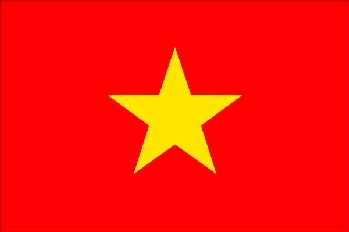 My friend Allie excitedly told me about CNN Go’s website and a listing there of Hanoi’s top ten street food shops. Now of course I am forever leery of mainstream lists of items I fully want to sample away from the western masses. Throwing caution to the wind, we carefully mapped out a plan of attack to try three items in one afternoon down in the Old Quarter….crab stuffed spring rolls, grilled squid, and crab noodle soup. We braved the chaos and a few wrong turns on motorbikes and of course in grand, yet typical Vietnamese style, our first stop totally crapped out. The bún riêu cua, or crab noodle soup, at 11 Hang Bac Street was a merely a closed up store front. We moved on down the block to 58 Dao Duy Tu Street for the spring rolls and the address in question was a nail joint. We looked and looked but all we saw was a woman getting her feet sanded down and another deep into some serious claw painting. Now keep in mind in Vietnam a restaurant inside a nail salon is hardly a stretch as I have eaten in a dress shop and hardware store over here. We wanted to be extra certain this was indeed strictly a nail joint so we walked in and created all sorts of hell breaking loose. One of them was holding scissors so who knows where those might have landed. Rapid fire chitchat ensued amongst all the women so we carefully backed our way out of there before someone cut us. It was like we descended into some sort of sacred inner sanctum. The last stop at 36 Hang Bo for grilled squid crapped out as well but a lady manning a boiling cauldron of red broth did have the elusive bún riêu cua on offer. Since this crab soup was on our original list we decided to bite. The narrow open front shop’s very darkened interior with blackened walls had definitely seen better days. Construction noise in the background made us wonder if we were seconds away from imminent demise in a sea of collapsed rubble. You laugh at my worries but last year slipshod renovation techniques brought down a 5 story Pizza Hut and adjoining buildings here in Hanoi when the workers removed all the load bearing walls inside the Pizza Hut. The soup lady yelled at someone to flip on all the lights in an obvious gesture to please us westerners. Oh I wish she had kept them turned off. The place just screamed what the hell am I doing in here. That’s ok. Though the surroundings were less than desirable the soup was good. 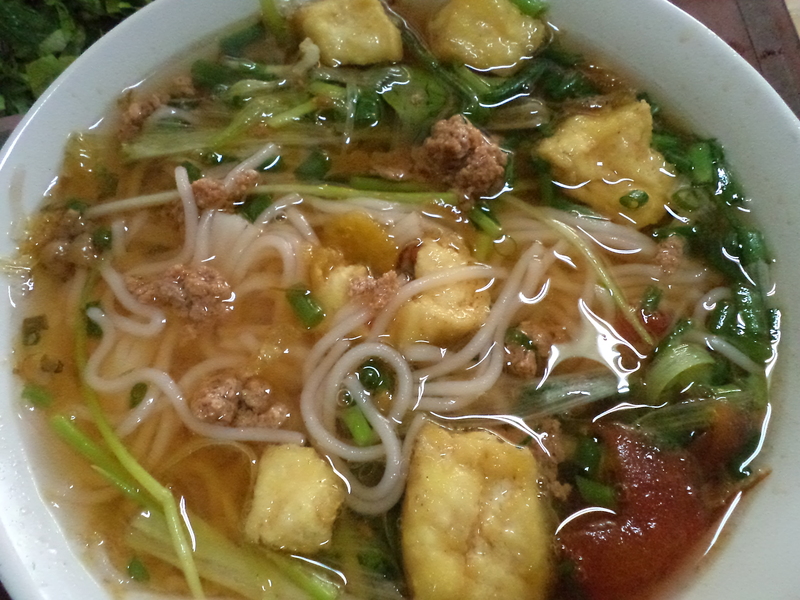 The broth tasted faintly of seafood and tomatoes and the rice vermicelli and fried tofu chunks were soft and tender. I didn’t notice any strips of crab but some greyish meat sliced off a loaf floating inside the cooking pot might have been the seafood. Shredded herbs from dill to purple perilla straight out of a dirty plastic basket added a huge range of competing but great flavors. The source of this bún riêu cua wasn’t on the official CNN Go list, but I think we actually came out ahead by finding our own path well off the trail.